The best of the best when it comes to rugs is handmade or hand-knotted rugs. These rugs are made from natural fibers like wool and silk. You can find them in antique varieties or you can even purchase them brand new. On the contrary, machine made rugs are manufactured to replicate handmade rugs. Typically designs will have been updated and you can find them in more modern designs. Machine made rugs can be made from natural fibers like the handmade rugs and also come in synthetics such as nylon and olefin. With rugs, typically the name of the style of the rug indicates where the rug originated from, specifically with antique rugs. This is why we have names such as Persian, Orientals, and Navajos. It’s important when shopping for a rug that you have some important style information to help you make the right choice. Persian Rugs: These rugs are hand-knotted and have a wide border around the main pattern of the rug. These rugs come from what is now known as Iran and where today there are over 50 different Persian styles. These rugs can also come from India, Pakistan, China and other European countries. Oriental Rugs: For many this has become a generic label for rugs which makes this a very confusing category. True Oriental rugs originate in Afghanistan, China, India, Iran, Nepal, Pakistan, Tibet, Turkey, Azerbaijan, Armenia, Romania, Albania, Morocco and Egypt. These rugs are always hand-knotted and never made of olefin or nylon. Chinese Rugs: These rugs are very expensive and sought after. They are typically very dense, have vibrant colors, are made of five-ply wool and are sculpted. “Chinese style” rugs have similar designs to Chinese Rugs and are mostly hand-tufted and wool, however the price point on Chinese style rugs will be about half of a real Chinese rug. Turkoman Rugs: Produced by weavers in Turkmenistan, Uzbekistan, Afghanistan and Khorassan. These rugs will have a background of red to red-brown in geometric patterns with white, blue and black highlights. Navajo Rugs: These rugs actually began as blankets made of wool and were used by the tribes to keep warm and dry. These blankets had geometric patterns mostly and were flat woven. When the American government forced the Navajos onto reservations, it created the need for them to make money, which made the blankets become the rugs we know today. These rugs are now mostly made in weaving plants on the reservations using modern techniques with Navajo designs. The only pieces now made by traditional Navajo weavers are pieces of art and not rugs. Braided Rugs: You may also know these rugs as “rag rugs.” These rugs are most often associated with the early United States and are oval in shape. These rugs were made by braiding long coils from wool, chenille or even rags. The coils were then stitched together to form the rug. Today these rugs are still being made mostly by machine, although some are still handcrafted. Most commonly the machine made variety will be olefin or nylon and will be very durable. Flokati Rugs: These rugs originated in Greece about 1,500 years ago. These are fluffy white rugs that are 100% hand-woven and made of wool fibers. These Greek rugs can be handmade or machine made but the true test is the weight of the wool. A Flokati rug will have wool weighing 2,000, 3,000 or 4,000 grams. Natural Rugs: Natural rugs are made of four types of grass including Jute, Sisal, Seagrass and Bamboo. Sisal Rugs come from the leaves of the Agave Sisalana plant. 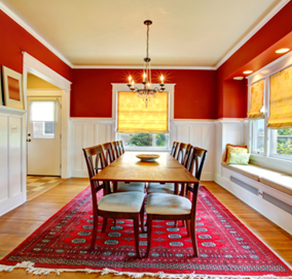 The color of these rugs can differ from a straw yellow to a creamy color. You will sometimes find the sisal rugs being blended with nylon to give them a softer feel. These rugs can be durable and are also anti-static, naturally insulating and fire resistant. It is very important to note that they do not absorb water so therefore they should not be used outdoors, in bathrooms, kitchens or other areas where they could get wet. Jute Rugs typically come in neutral colors and are a flat woven type rug and can be combined with wool and hemp. Additionally, the Jute yarns are used in hand knotted rugs as the warp yarns. Seagrass Rugs are flat weave rugs that are non-absorbent, low dust, allergy free, and hard. They come in different weaves such as a herringbone or basket weave design. These rugs are also stain resistant and dry dirt easily brushes off of them. Bamboo Rugs, like the other naturals are a flat style rug, however they are not woven. The strips of bamboo are laid side by side and are adhered together with edging.